CDAC Partner Jung-Fu Lin and colleagues from The University of Texas at Austin and Amherst College have described a new technique that might one day reveal the composition and characteristics of the deep Earth in higher detail than ever before. However, the technique relies on the long-range electron spin-spin interaction, a fifth force of nature (in addition to gravity and the weak, strong and electromagnetic forces) that has not yet been detected, but which some particle physicists think might exist. If it does exist, this exotic new force would connect matter at Earth's surface with matter hundreds or even thousands of kilometers below, deep in Earth's mantle. The way these particles interact could provide new information about the composition and characteristics of the mantle, which is poorly understood due to its inaccessibility. Lin and his group have been researching the electronic spin transitions of iron in lower-mantle minerals as well as the potential implications of the effects of the transitions in deep-Earth geoscience. 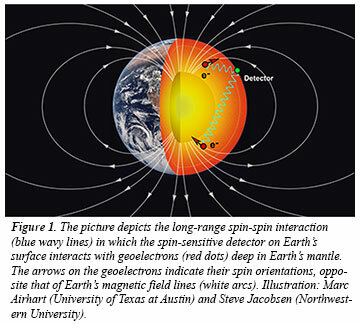 They believe that this new geoelectron model opens a new window for future understanding of the consequences of the spin transitions that remain debated in deep-Earth research. When earth scientists have tried to model how factors such as iron concentration and physical and chemical properties of matter vary with depth, they get different answers. The fifth force, assuming it exists, might help reconcile these conflicting lines of evidence. The group’s research is published in Science [L. Hunter et al., Science 339, 928 (2013)].